Samsung has just unveiled its Galaxy Note 9 with a gorgeous 6.4-inch OLED display. Apple is preparing to announce a large 6.5-inch iPhone X Plus besides the 5.8-inch second-gen iPhone X next month. Within weeks of the iPhone X Plus launch, Google will show off its third-generation Pixel phones. Thanks to torrents of leaks and rumors, we know a lot about the upcoming Pixel devices. A new leak suggests the Pixel 3 XL display will be even larger than the iPhone X Plus and Galaxy Note 9. 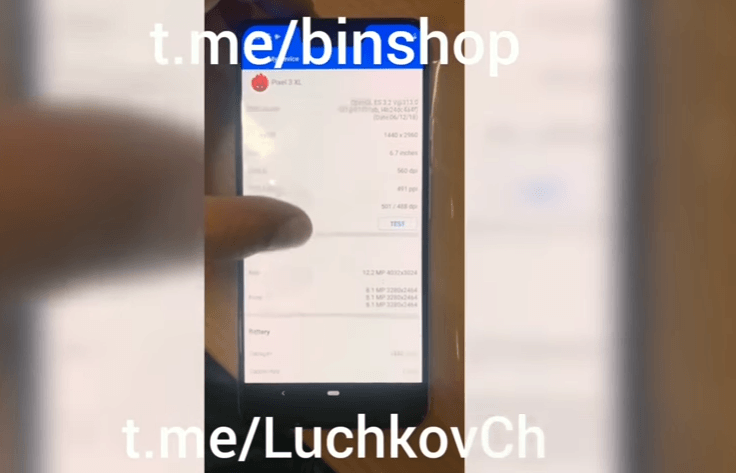 A Ukrainian blogger has shared an unboxing video of what appears to be a pre-release unit of the Pixel 3 XL. The device looks genuine, and is stamped by Google. The blogger had earlier shared a picture of the device on their Telegram channel. According to the leak, the Google Pixel 3 XL display measures a huge 6.7-inch diagonally. It makes the Pixel 3 XL display will be larger than Galaxy Note 9’s 6.4-inch. Even the upcoming iPhone X Plus is said to have a smaller 6.5-inch screen. By comparison, previous reports have suggested that the regular Pixel 3 would sport a 5.3-inch P-OLED display. It is unclear why Google is going for such a huge screen. The 6.7-inch Pixel 3 XL display could make the device too large, especially considering it will not be completely bezel-less. The latest video leak as well as pictures shared by XDA Developers recently indicate that it will have a thick chin at the bottom for stereo speakers. By opting for a 6.7-inch size for the Pixel 3 XL display, Google will be missing the sweet spot for phablets, which is 5.5-inch to 6.5-inch. The smaller Pixel 3 is said to have a 5.3-inch screen. Google has added native support for the display notch in Android 9 Pie, so the larger screen should offer a good user experience while playing games or watching videos. But the phone itself would be too big. The video leak contradicts an earlier report from reliable Twitter leaker Steve Hemmerstoffer, who said the Pixel 3 XL would sport a 6.2-inch display. We expect to see more leaks in the coming weeks as we move closer to the launch. The Ukrainian blogger benchmarked the pre-release device on AnTuTu. The benchmark listing confirmed that it would sport a 6.7-inch screen and a giant 3430mAh battery. The battery size seems huge until you figure that last year’s Pixel 2 XL had a bigger 3520mAh battery and a smaller 6-inch screen. Google is increasing the screen size but reducing the battery size. Only time will tell how it will affect the new phone’s battery life. The device runs Android 9 Pie. It retains the Pixel line’s signature two-tone design. According to the leak, the phone has a deep display notch, a screen resolution of 2960 x 1440 and a pixel density of 494ppi. The Pixel 3 XL is powered by 4GB RAM, which seems too low for a premium Android phone. The Galaxy Note 9 comes in 6GB and 8GB RAM variants, which come handy when playing games or running demanding apps. Even the OnePlus 6 offers up to 8GB RAM. In terms of camera, it has a single 12.2-megapixel lens on the back and two 8.1 shooters on the front. It’s in line with past leaks that suggested the new Pixel phones would offer dual cameras on the front, probably to enable advanced 3D facial recognition. But why is Google sticking to a single rear camera when most of its rivals have moved to dual or triple cameras? Maybe because the company is confident that its AI-powered single camera could take better pictures than Huawei P20 Pro’s triple camera system. The unboxing video also indicates that the smartphone will ship with a pair USB-Type C headphones. Google ditched the 3.5mm headphone jack from Pixel phones last year. The search engine giant is expected to unveil the Pixel 3 and Pixel 3 XL on October 4th, the same date on which it has unveiled the previous two generations of Pixel phones. A Famebit ad listing also revealed that the new Pixel phones are coming out on October 4. Google is also rumored to unveil the second-generation Pixel Bugs, Pixel Watch, and an improved Pixelbook laptop at the same event.